In Summer 2003 the first successor of the D1-series - the Nikon D2H - was introduced. It was obvious that after a Nikon D2H a Nikon D2X would be introduced. Why both cameras weren´t introduced simultaneously has never been published. Some 14 months (mid 2004) later the D2X came on the market, followed by an upgraded version - as Nikon D2Xs - mid 2006. Right: Nikon D2H, left the D2X which came 14 months later. 100 % identical bodies, including the lay out; except the D2H has no type name under the TFT-screen. The new series of Nikon professional digi-SLR´s weren´t just upgrades of the D1-series. Although the camera bodies have more or less the same shape, internally they are very different. Nikon introduced a brand new, self-developed sensor (JFET-LBCast) in the D2H with 4.1 Mp. and a CMOS-sensor in the D2X with 12.4 Mp. The D2H was for fast shooting, the D2X for high resolution. The D2X has some improvements over the D2H. The menu is presented in 10 languages (D2H has only 6), the auto focus is faster, in high-speed crop (at 6.8 Mp; crop factor 2) the camera is as fast as the D2H (8 fps) and the TFT-screen has more (232,000) dots (D2H has 211,000). The last version, the Nikon D2Xs has all features of its predecessor. In comparison with the D1-series most functions are faster and better, LCD screens are larger, and (!) batteries are different, so are the charger and net adapter. The maximum shutter speeds went down from 1/16000 sec. to 1/8000, which is still incredibly fast, though. The upgraded version of the D2H - Nikon D2Hs - was introduced in February 2005. All four cameras are clearly much better than their ancestors. Second hand cameras, especially the D2X(s), are very much wanted and thus relatively expensive. At the back of the camera body a large screen with most dials and buttons. Extra - in comparison to the D1-series - is the possibility to enlarge (to a greater extend) each picture on the screen and to add a spoken message to each picture taken. 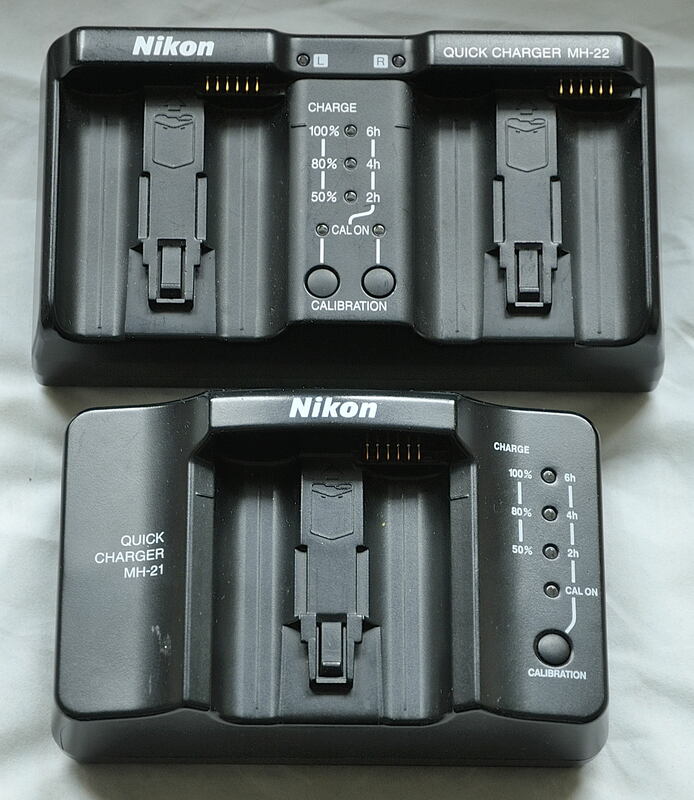 Above the Nikon Quick Charger MH-21 and Nikon MH-22, which has room for two batteries, but does NOT charge two batteries simultaneously! After charging or calibrating one battery has finished the second battery will be charged! The Nikon D2H is the first Nikon digital SLR that can be equipped with the Nikon WT-1 wireless transmitter. It is possible to transmit images wirelessly from the camera to a device (PC, Mac, laptop, server etc.) with installed FTP software. With an additional WT-1 firmware upgrade (L 1.1) the other cameras in the D2-series can be used as well. For the Nikon D2H Nikon Corporation issued a firmware upgrade (2.01) early 2005 and (2.02) early 2006. For the Nikon D2Hs and D2X each a firmware upgrade (2.02) in September 2006. For the Nikon D2Xs no upgrades are available. Ask your dealer or the Nikon representation in your country for more details. All cameras sold after those dates should have the firmware upgrade. 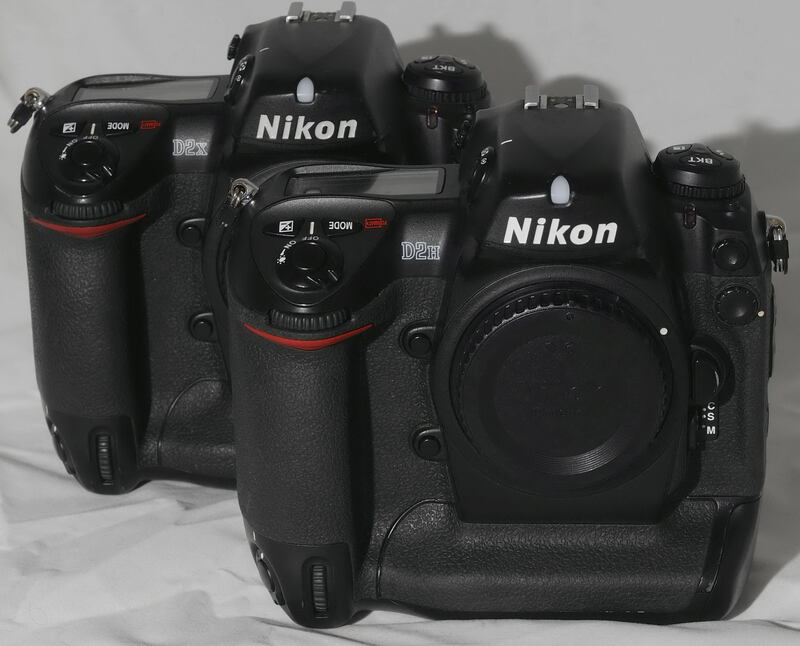 Nikon D2X and Nikon D2Xs are externally 100% identical. 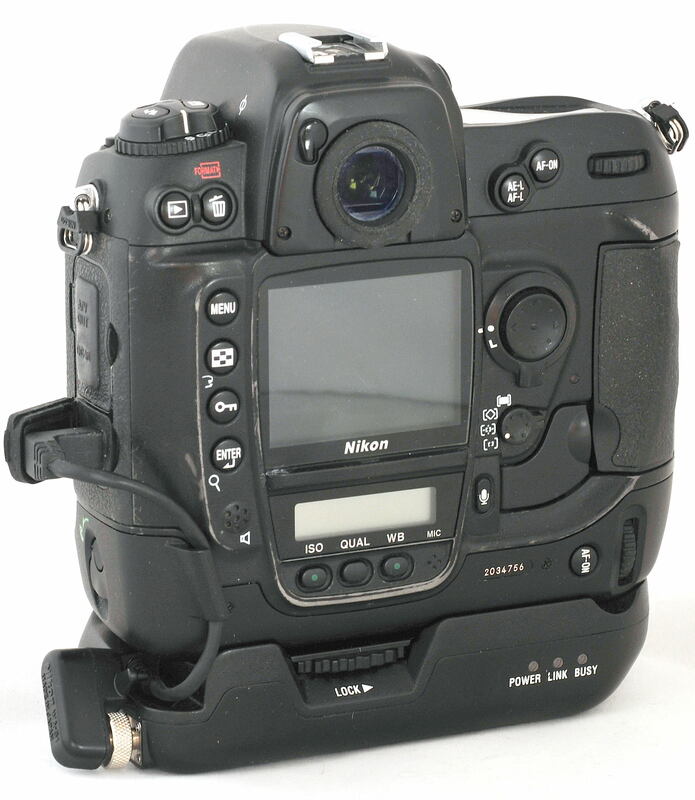 After the latest firmware upgrade of the Nikon D2X internal differences are gone. 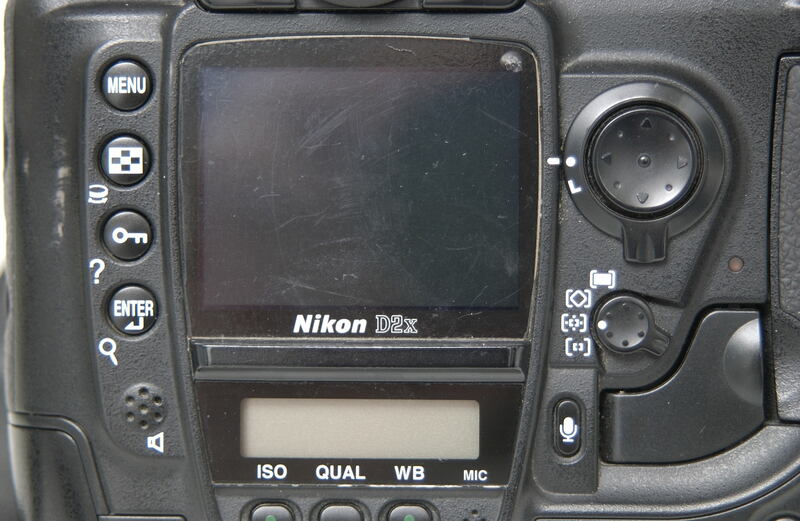 Be aware of the fact that CF-cards, used on the D2-series may give problems when read in older Nikon View software. Especially NEF-files! It is also difficult to use CF-cards on both D1- and D2 bodies, as the D1 bodies run under FAT-16 and D2 bodies under FAT-32. Although Nikon Corporation was very proud to announce its own JFET-LBcast sensor, that particular sensor has never been used again in a newer product! All cameras became available some 4 months after their introduction. The total number of production is unknown (yet). For the D2H, D2X and D2Hs Nikon issued firmware upgrades. Note: Many early Nikon D2H cameras (#2040xxx and earlier) had severe problems with their shutter and with their exposure program module. When switching the camera on and pressing the shutter button 'ERR' will appear in the upper lcd-window (see above). After several shots it will disappear. But after a long rest of the camera this ERR will show up again. Most problems were covered by the guarantee, but older cameras for sale will be difficult to repair now as those particular parts are not available anymore. Inside the tripod adapter screw at the bottom of the camera a green spot (see above) may indicate that the shutter and the exposure meter unit has been replaced. An uncertain method BTW! If a new shutter has been placed the internal shutter activations counter is not set to zero. Thus making it difficult to know how many shutter activations a newly placed shutter has had. Using Opanda Exif Reader- however - it is possible to read the shutter counter. See for more details this page.